So, we were actually treated to one more day on the boat. We had planned on staying two full days in Dubrovnik originally, but the crowds of tourists we so frightening that when my mom suggested that it might be nice for them to spend another day with the boys on the boat, we ditched Dubrovnik without hesitation. It was Quentin’s birthday and he was thrilled to have a little Grandma Meanie time, anyway. We ended up cruising out to the little town of Cavtat which is about 45 minutes away from Dubrovnik (by yacht, of course). We spent the first couple of hours “parked” somewhere offshore. The boys fed figs to schools of fish and practiced their dives and cannonballs off the back of the boat. 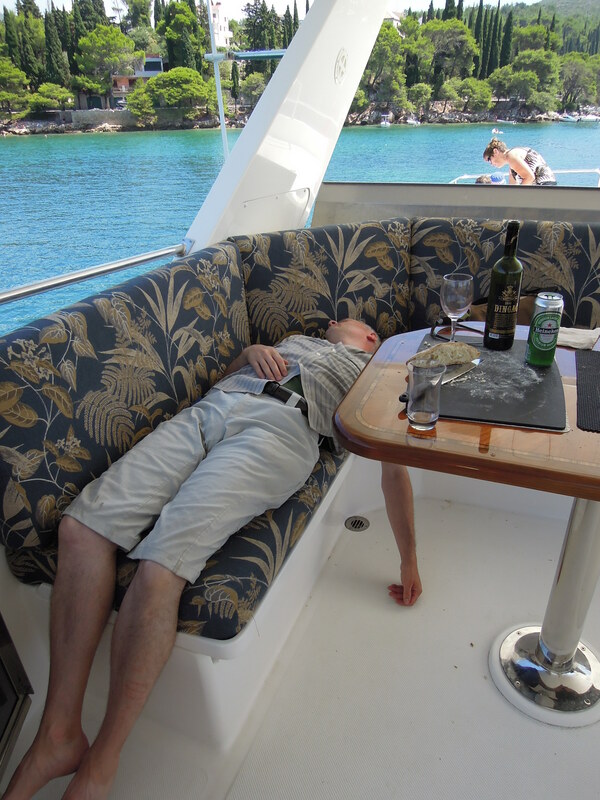 Stephen conked out after giving in to the gentle rocking of the boat (and possibly the alcohol which is clearly missing from the wine bottle in the photo). Not a bad life, eh? Cavtat itself is a gorgeous little town with a nice local vibe and manageable crowds of tourists. Its restaurant scene isn’t anything special, but I enjoyed the slower pace. It has a seawall which winds around the town and its teardrop shaped peninsula. The water is the most beautiful, clear green-blue and is full of small fish. We all enjoyed crouching down to watch these fish. Actually, the beaches all around Dubrovnik and Cavtat were amazing. They aren’t sandy and flat…they are rocky and full of interesting caves and pools. I wish we were still there! The following day we tried to tackle the fortifications of Dubrovnik, but we just couldn’t stomach the price to climb the stairs and walk around the outside wall in the blazing sun with thousands of people. So, we relegated this task to our life’s “to do” list and wandered around inside the walls. Our minds were, unfortunately, on breakfast more than anything else. We quickly walked up and down the narrow streets and followed the wall as closely as we could. It is a beautiful city, but it is just so hard to slow down and appreciate it when it is so hot and crowded! We left Dubrovnik by around noon and were on the road to Trogir. The roads were packed too, and we were held up in lines on both sides of the Bosnian section of the coast. We found a great place to eat somewhere in a little valley in the Dalmation mountains. 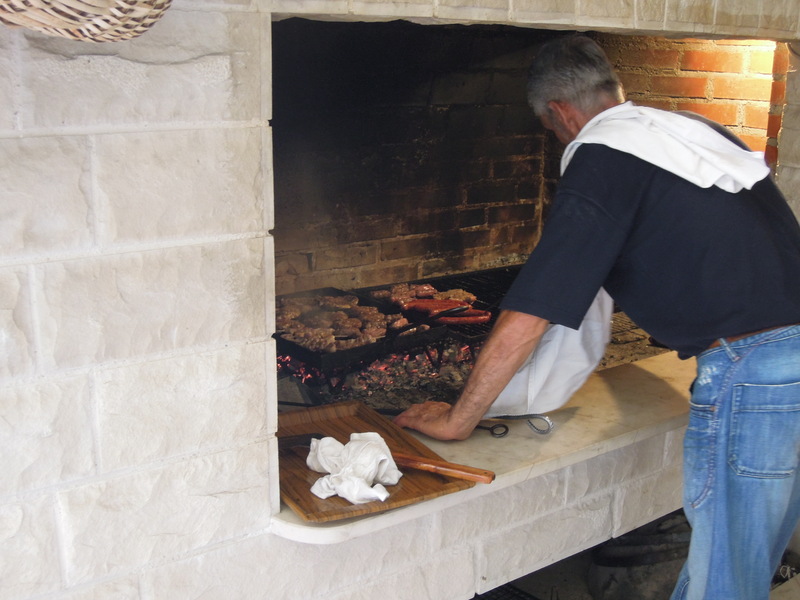 They cooked our food (mixed grilled meat with fried potato) in a big, wood-burning stove/grill over glowing coals. It was, of course, delicious. By 6:00, we were in Trogir. It is also a popular tourist town, but the crowds come in individual cars, rather than by bus loads and cruise ships. So far, we love the market (which is touristy and over-priced, but still authentic), the restaurants, and the cool pedestrian streets of the old town. The beaches here are not as beautiful or as accessible as what we experienced in Dubrovnik and Cavtat, but we still have a couple of days and are hoping to find at least one pretty spot that compares. The weather has been hot, hot, hot, by the way. Summer on the Adriatic! I’m still trying to figure out a way to make time slow down, but as of yet have been unsuccessful. « I’m On A Boat!